A Dix Hills grandmother has been a voice of Hadassah for 45 years. Ellen Hershkin’s ranch house in Dix Hills speaks volumes about her passion: Almost every wall boasts colorful Israeli art, daily reminders of a place she loves and has devoted much of her life to. Just last month, the 70-year-old grandmother of four took a trip to Israel, one of numerous visits Hershkin has taken over the last several decades — so many that people on the streets of Tel Aviv will call out to her. But this trip was something special. Hershkin took part in a whirlwind of national commemorative activities marking the 70th anniversary of Israel’s founding, on behalf of Hadassah, the Women’s Zionist Organization of America, which advocates for women in Israel and America. Its signature project is fundraising to support the Hadassah Medical Organization’s two hospitals in Israel, Hadassah Mount Scopus Medical Center and Hadassah Ein Kerem Hospital. Hershkin heeded his words. Since 2016, she has been national president of the 330,000-member organization, after serving as national vice president, chairing dozens of programs and committees, working on boards, and developing and leading workshops and seminars. On Wednesday, she will go to Washington D.C., to attend the Coalition for Women’s Health Equity’s second annual Women’s Health Empowerment Summit, and the following day, she will lead a delegation of women to Capitol Hill, to advocate for Hadassah’s positions on women’s health equity, the #MeToo movement, gun control and other issues. 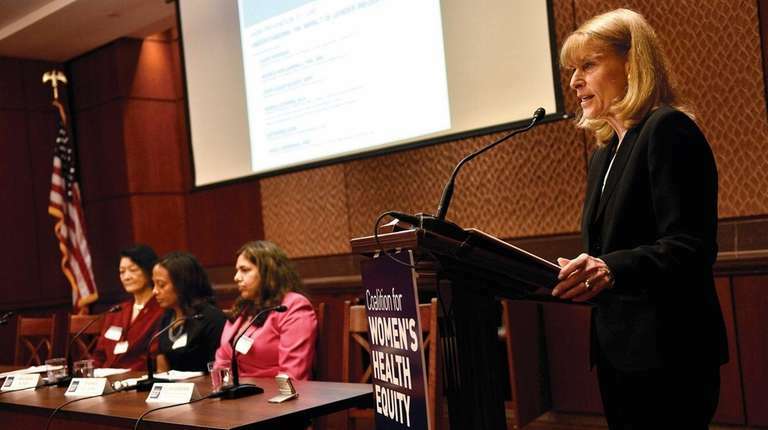 “Building relationships with women’s health advocacy organizations, policymakers and influential congressional leaders . . . we can find innovative solutions to eliminate women’s health disparities and improve the lives of women for generations to come,” Hershkin says. Though Hershkin has devoted the past 45 years to serving Hadassah, she became involved with the organization by chance. After studying speech and education at Hofstra University, she was 19 when she married Joel Hershkin. The couple lived in Flushing for seven years, before moving to Dix Hills in 1973. The previous owners of their house had been an elderly couple, so when word got out that a young family had moved in, “everybody came running,” wanting to recruit Hershkin to their various causes and organizations, she says. A neighbor invited Hershkin to a Hadassah new member tea, where she met Patty Lerner, the chapter president. When the Yom Kippur War (also known as the 1973 Arab-Israeli War) began, Lerner asked Hershkin to come with her to raise money outside a Waldbaum’s on Deer Park Avenue for a Hadassah hospital. The busy mom turned her down, adding that she knew little about the organization or Israel’s medical crisis. But Lerner persisted and on their way to the supermarket, briefed Hershkin about the group’s efforts on raising money for hospital supplies for the wounded. “In a split second, I knew she was right,” Hershkin says. “I was 26 years old. I wasn’t going to Israel to help my people, but this woman and organization were giving me an opportunity to do something, not just talk about doing something.” And then, a chilling incident occurred outside the supermarket, which would alter Hershkin’s life. A volunteer organization, Hadassah was founded for Jewish women in Temple Emanu-El in New York City in 1912, before Israel became a state, and before American women obtained the right to vote. “Hadassah was Queen Esther’s Hebrew name. She was the heroine of the Purim story,” Hershkin says from her kitchen table as she offers up homemade macaroons. Since the organization was established around the time of that Jewish holiday, it was named after her. Hershkin, who grew up in East Meadow, has two adult children, Marc, who lives in New Jersey and Lisa Hershkin Roth, 50, a Hadassah chapter member in California. Hershkin has had some health issues of her own. A car accident in 1991 left her with severe whiplash. Then while recovering from elective foot surgery in 2002, her spinal cord became compressed, resulting in nine hours of neurosurgery to reconstruct her neck “with metal, nuts, bolts, plates, rods and a piece of bone from my hip,” followed by 15 months of physical therapy, she says. That hasn’t stopped Hershkin from logging in more than 600,000 air miles, traveling between the United States, the Middle East and Europe. “She has an incredible passion for this organization, and a deep commitment,” says Janice Weinman, Hadassah CEO and executive director. 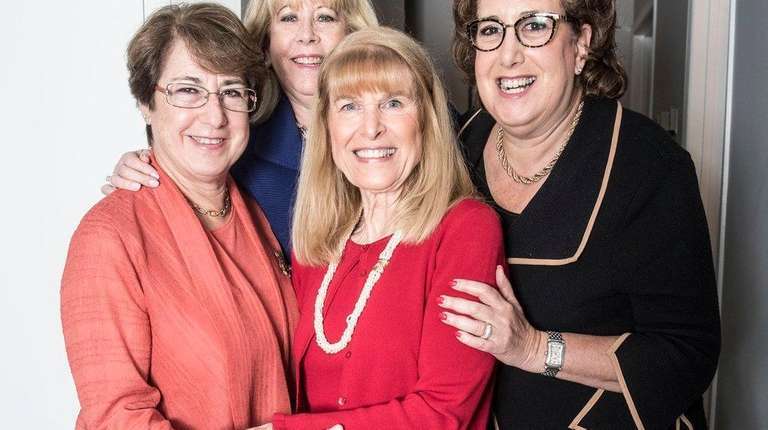 Since her initial involvement with Hadassah, Hershkin, who worked in travel for 20 years, has been a two-time recipient of the group’s Woman of the Year Award. She cites another exciting honor: last May, Hershkin and Hadassah Medical Organization Director General Zeev Rotstein, escorted first lady Melania Trump and Sara Netanyahu, the wife of Israeli prime minister Benjamin Netanyahu, on a tour of Ein Kerem hospital campus. Hershkin says she explained to Melania Trump how the medical agency, which was nominated for the Nobel Peace Prize in 2005, is the only American-owned hospital in Israel, and thanked her for the U.S. government’s American Schools and Hospitals Abroad grant, which enables the facility to purchase necessary state-of-the-art equipment. The medical organization was one of the first to receive a grant in 1963 and is still receiving it to this day. Speaking with the two first ladies is at the top of many personal highlights during her time with Hadassah, says Hershkin, who’s also served on the board of directors of the Jewish National Fund and has participated in many other causes.